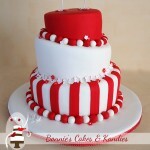 In the world of cake decorating, it’s always fun to do something different! Today’s cake was different in the best kind of ways with bright colours, a fun cake topper, and a personalised ribbon with a very sweet message. 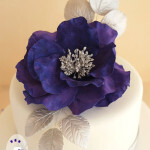 I have been looking forward to sharing the details and images of this cake, but I must admit that while professional photographers have the knowledge, skill and experience to make it look easy, I have a lot of trouble getting green and purple to show up as true to life in colour in my photos. I guess that’s why I’m behind the rolling pin, not the lens! 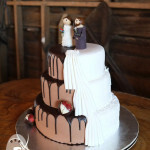 Danielle & Jared supplied me with a picture of a similar cake (original designer unknown) as inspiration. They personalised the design with a few key words, which were beautifully reflected all the way throughout their reception décor: ‘green’, ‘purple’, and ‘butterflies’. 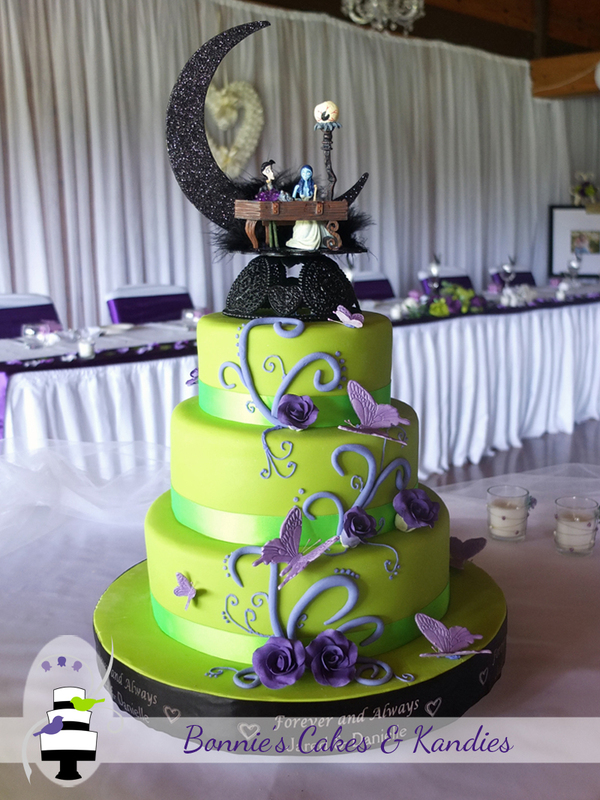 I placed a cake topper on to the top tier, which was supplied by the gorgeous couple, and really complemented the contemporary design of the cake. Oh, and see that eyeball lantern on the topper? This topper had a working light! I told you it was fun! I am very grateful to Vanessa, the mother of the groom, for giving me permission to use her (beautifully coloured!) 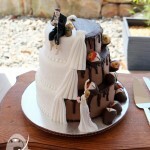 photographs of Danielle & Jared’s bonbonniere. Thank you, Vanessa! Vanessa decorated purple butterfly boxes, which each held a purple and a green foil covered chocolate rose. I made the chocolate roses in two flavours – dark chocolate butterscotch, and dark chocolate raspberry. Danielle & Jared also chose green, mint choc chip lollipops in a puffed heart shape, to add a little more sweetness to their day. 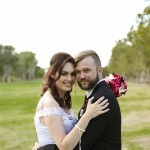 Thank you to Jared’s mother, Vanessa for permission to share her photographs of Danielle & Jared’s wedding bonbonniere. 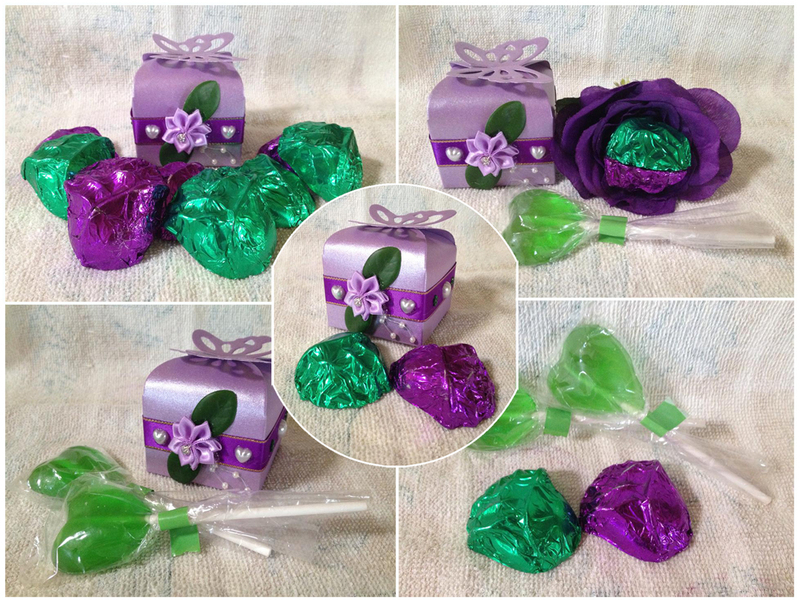 Lollipops and foil-covered chocolate roses placed inside perfectly-sized purple butterfly boxes. To the wonderful Jared and Danielle: here’s wishing you lots of love, happiness and laughter – forever and always. Congratulations.